Washington – The pool of candidates for Rep. Elizabeth Esty’s congressional seat grew again on Wednesday as Waterbury teacher Jahana Hayes joined the race as a Democrat. Hayes, who was the 2016 National Teacher of the Year, has her own compelling personal story. She grew up amid poverty and drugs in Waterbury and became pregnant when she was 17. But, with help of some of her teachers, Hayes finished high school and eventually enrolled in community college. She went on to earn a four-year degree and became a high school history teacher at Waterbury’s John F. Kennedy High School. She is now the talent and professional development supervisor for Waterbury public schools. 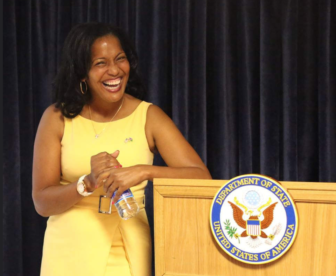 Hayes traveled the country and abroad, giving speeches, after she was selected Teacher of the Year by an association of chief school officers in 2016. But, like several other candidates for the 5th District seat, Hayes, who lives in Wolcott, has no experience in public office. Esty chose not to run for re-election after she was the target of a firestorm of criticism for the way she handled a staffer accused of abuse. Others running for that open seat are Republicans Liz Peterson of Simsbury, Ruby O’Neill of Southbury and John Pistone of Brookville. Like Hayes, these GOP candidates have not held political office before. Neither has Democratic candidate Newtown Rabbi Shaul Praver. Former Meriden Mayor Manny Santos, a Republican, is also running, as are Democrats Mary Glassman, a former selectman in Simsbury, and Emmanuel Sanchez, a New Britain alderman.